An 18 month old steer that yielded a 750 pound carcass that is just the type of animal that we are striving to produce, well finished and nicely muscled. 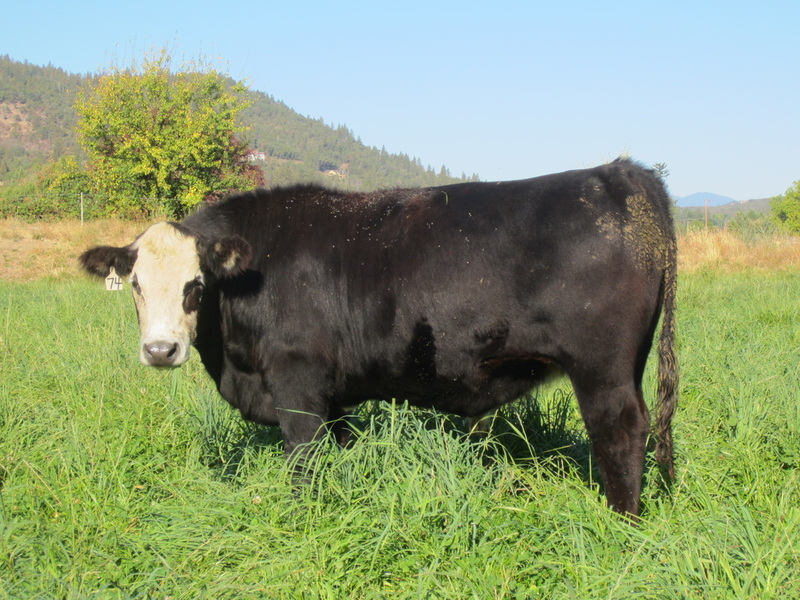 Several long yearling steers on fall pasture in 2014 as their harvest date nears. Besides offering quarters, halves, and whole beeves, we also now have three steers packaged into individual cuts that were federally inspected and available for purchase by the cut. Please see our prices for those individual cuts posted below. We can put any package together of a mixture of a variety of cuts at a discount to these prices. This is a nice opportunity for new customers to sample our beef without making the larger purchase of a share of an animal. It also allows you to only purchase the specific cuts that you prefer. Most of our beef is processed by Montgomery's Meats which is located at 175 N. 1st Street in Central Point. 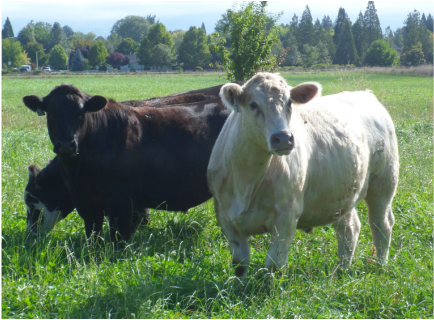 Our butcher, Joe Speelman with Alpine Meat Co. in Grants Pass, comes to our farm where he harvests our animals and then trucks the carcasses to Montgomery's facility which is only about a mile away. We believe that harvesting our animals right here on the farm in a corral that they routinely travel through is the most humane way possible. Alpine's harvest fee is $70 per animal. We really appreciate our relationship with the folks at Montgomery's Meats. The role they play in helping us provide a top-flight eating experience for our beef customers is very important. After our carcasses arrive at their door, they are weighed, rolled in the cooler, and then aged for 10 to 12 days. This period of aging permits the natural tenderization of the meat without allowing the carcasses to dry out too much. The meat cutters at Montgomery's then take the cutting instructions that our customers have provided and process the carcass into the various cuts and package them in freezer paper that is labeled with the name of the cut. Then the packages of beef are placed in crates and rolled into their freezer where they are flash frozen. The total cost of our beef includes the price we charge for the beef in addition to the processing charges that you will pay to Montgomery's Meats at the time the meat is picked up. When you purchase beef from us, you are buying a portion (shares) of a live animal, either a whole, half, or quarter (split side). Then you are hiring Montgomery's to do the processing (cut and wrap). Don't worry, we will help you along the way as the arrangements and cutting instructions are taken care of! If you are interested in organ meats, please let us know prior to harvest so we can make those arrangements. Again this year we are requesting a $100 per quarter, $200 per half, or $400 deposit for a whole beef to guarantee your beef for the fall. Montgomery's Meats cut and wrap fee is 75 cents per pound of carcass weight. Harvest fee per head is $70 which is prorated for the quantity you purchase. Disposal fee per head is $12 which is prorated for the quantity you purchase. This fee was added by Montgomery's Meats when they lost rendering services that had hauled off their trim, bones, and other by-products. An approximate total cost of a half beef from an average carcass would be as follows: A half of a 700 pound carcass yields 350 pounds and when multiplied by $3.50/pound equals $1225. Then add in the harvest fee of $35 ($70 divided by 2) plus the cut and wrap charges (350 pounds X 75 cents a pound which is $263) and the disposal fee of $6 ($12 divided by 2). So, you would pay us $1225 as soon as I report out the weight and then you would pay Montgomery's Meats $304 when you pick up your meat. The average total per pound cost for your packages of beef should be close to $7.50. A half of beef from an animal producing a 700 pound carcass would yield approximately 200 to 210 pounds of retail cuts of beef for your freezer. Your assortment of cuts ranges from ground beef to tenderloin. If you purchase a whole beef, your cost per pound will be slightly lower and the cost per pound of a quarter beef will be a little more. In 2018, we had about 35 young cattle averaging 18 months of age processed at Montgomery's Meats. The average carcass weight was in the upper 600 pound range and most weighed from 600 to 750 pounds.